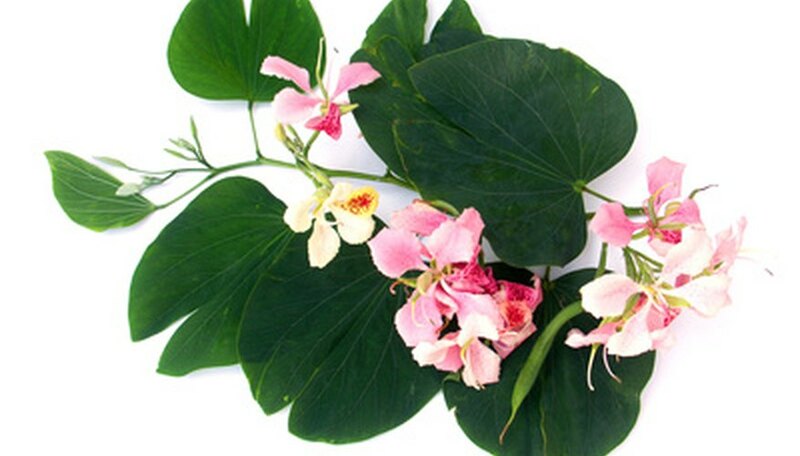 Orchid trees (Bauhinia spp.) are fast-growing tropical native to southeastern Asia. They display large five-petalled flowers that look like orchid blossoms. Species include the white orchid, Hong Kong orchid, fall orchid and the mariposa. Pruning helps develop a well-structured tree and prevent seed pods that may become litter and germinate later in your garden. Orchid trees are grown outdoors only in USDA hardiness zones 9 and warmer. Monitor the growth of your orchid tree across the growing season. Inspect for problematic branches, such as those that are dead, diseased, rubbing against each other or are growing low on the trunk, causing a safety hazard or access issues. Prune off dead and diseased branches and twigs as soon as they are encountered, regardless of the season. Make a pruning cut with a hand pruners 1/4 inch above a lower living branch junction or next to the main branch or trunk. Make the cut with loppers, if the branch's diameter is greater than 1/2 to 3/4 inch. Sometimes using a hand-held pruning saw makes cutting off branches flush with the trunk easiest. Trim off any fast-growing, leggy growth stems from the trunk. Remove any branches that are rubbing against each other so that only one remains. Take off entire branches that grow inward across the center of the tree's canopy. Make the cut 1/4 inch flush against the larger branch or trunk from where it grows, using the appropriately sized pruning tool. Reduce the length of branches across the entire orchid tree canopy by one-third to one-quarter after the annual flowering display ends. Repeatedly remove any suckers and low-reaching branches that block access to the orchid tree's trunk across the calendar year. Expect new suckers to grow back from pruning wounds year round. Reduce the amount of pruning on the orchid tree. Make cuts on branches that only truly need it. The tree's response will be to produce large amounts of weak watersprouts from the pruning wound region, either immediately or next spring. Trimming back branches annually after flowering removes seed pods and has minimal effects of copious watersprout production. Focus on cutting twigs no wider than 1/4-inch in diameter. Generally speaking, orchid trees do not need lots of pruning but are appropriate only in spacious landscapes where there is minimal need to maintain them as smaller, formal-looking specimens. Cutting back branches lightly from their tips helps maintain a smaller size plant as well as prevent branches from getting too large and heavy, possibly breaking from a windstorm. Know what time of year your orchid tree species blooms. Do not prune within four months before the expected flowering display, otherwise you cut off wood that will yield flowers. In regions with mild but occasionally frosty winters, hold off pruning until late winter to early spring, if it does not interfere with the expected flowering season.